My compilation of Mill's political writings: [PDF 52 MB]. It is divided into 5 sections which are listed below. James Mill [Reply to Macaulay] From a Fragment on Mackintosh (1835). See: James Mill: Political Writings, ed. Terence Ball (Cambridge University Press, 1992). Since James Mill was a "political economist" the distinction between his writings on "politics" and "economics" is a mute one in any case as Winch implies by including in his anthology of economic writings material on the Hindus in India. This anthology of his writings on "politics" and "society" tries to fill the gap by focusing less on his technical work on economic theory and policy and more on his essays and reviews written over a 20 year period on various aspects of British politics and society. There is a special emphasis on his social theory of class and exploitation which seemed to become more important to him during the struggle to reform the British system of government in the years leading up to the First Reform Act of 1832. See the List of his works at the OLL: <http://oll.libertyfund.org/person/73>. See the works at this site. For more information about James Mill see the 19th century biography by Alexander Bain and the "Biographical Sketch" by Donald Winch in the Selected Economic Writings (1966) <http://oll.libertyfund.org/title/100/30337>. The bibliography in James Mill, Selected Economic Writings, ed. Donald Winch (Edinburgh: Oliver Boyd for the Scottish Economic Society, 1966). BIBLIOGRAPHY <http://oll.libertyfund.org/title/100/30518>. The complete anthology in one file (760 pp. ): [PDF 52 MB]. The British Review, and London Critical Journal. Vol. VI. (London: Baldwin, Cradock, and Joy, 1815). "Dugald Stewart's “Elements of the Philosophy of Mind”," Aug. 1815, vol. VI. pp. 170–200. [PDF 5.4 MB]. Caste, vol. 2, pp. 674-54. [PDF 1 MB] and HTML. Parliamentary History and Review; containing Reports of the Proceedings of the Two Houses of Parliament during the Session of 1826: - 7 Geo. IV. With Critical Remarks on the Principal Measures of the Session. (London: Longman, Rees, Orme, Brown, and Green, 1826). [James Mill], "Summary Review of the Conduct and Measures of the Seventh Imperial Parliament" pp. 772-802. The Westminster Review. (London: Baldwin, Cradock, and Joy, 1824-1836). "Periodical Literature 1 (Edinburgh Review and Quarterly Review)," Jan. 1824, vol. I, no. I, pp. 206–68. [PDF 2.6 MB]. "Periodical Literature 2 (Quarterly Review and Edinburgh Review)," Oct. 1824, vol. II,no. IV, pp. 463–553. [PDF 4.8 MB]. "Robert Southey's Book of the Church," Jan. 1825, vol. III, no. V, pp. 167–213. [PDF 2.6 MB]. "Ecclesiastical Establishments," Apr. 1826, vol. V, no. X, pp. 504–48. [PDF 2.2 MB]. "Formation of Opinions," Jul. 1826, vol. VI, no. XI, pp. 1–23. [PDF 1.1 MB]. "State of the Nation," Oct. 1826, vol. VI, no. XII, pp. 249–78. [PDF 1.3 MB]. "The Ballot," Jul. 1830, vol. XIII, no. XXV, pp. 1–37. [PDF 1.7 MB]. 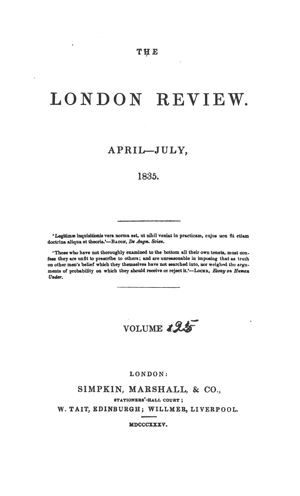 The London Review (London: Simpkin, Marshall, & Company, 1835). 2 vols. James Mill signed the articles "P.Q." "Aristocracy," Jan. 1836, vol. II, no. 4, pp. 283–306. [PDF 4.3 MB]. This was reprinted in a collection of pamphlets edited by John Arthur Roebuck, Pamphlets of the People, vol. 1 (London: Charles Ely, 1835). [PDF 1.2 MB]. 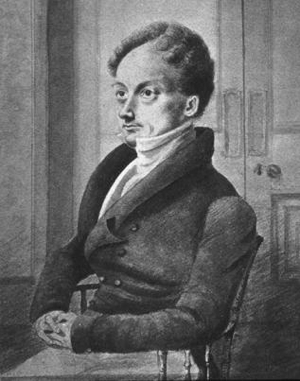 James Mill died on 23 June, 1836. That year the London Review merged with its rival the Westminster Review to become the London and Westminster Review. His last essay "Theory and Practice (signed with his usual "P.Q.") appeared in the first issue of the merged journal in the issue of Apr. 1836, vol. XXV, pp. 223–34. [PDF 563 KB].